Halfway into the 2017 Korean Baseball Organization season, foreign hitters new to the KBO have experienced mixed results, some adapting quickly and thriving, and others struggling to grasp the nuances of playing baseball in Korea. The success stories are impressive. 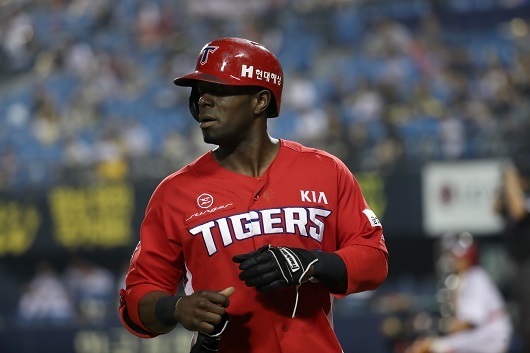 Roger Bernadina has slashed .314/.375/.529 for the league-leading Kia Tigers, and was elected as an All-Star starter. Samsung’s Darin Ruf has overcome his slow start, and is slashing .294/.394/.528. NC’s Xavier Scruggs is currently on the disabled list, but despite his extended absence has hit .284/.387/.581 and is tied for seventh in the league with 17 home runs. But aside from these three bright spots, the majority have struggled. With the exception of Bernadina, Ruf, and Scruggs, first-year KBO foreign players are hitting substantially worse than the league as a whole. One of these players, SK’s Jamie Romak, cited Korean pitchers’ ability to change speeds as a major challenge in adapting to the KBO. Milwaukee Brewers’ first baseman Eric Thames, who played in the KBO from 2014-2016 with the NC Dinos, agreed, saying that he struggled initially in Korea due to the myriad of breaking balls thrown by Korean pitchers. But when Thames adapted to the breaking ball and overcame his early strikeout problems, he changed the hitting landscape of the KBO, winning a Most Valuable Player award in 2015, and averaging 41 home runs a season. So for the new KBO rookies, whether experiencing early success or early troubles, there is a blueprint to follow.